Monika is Professor of Linguistics at the University of Essex as well as Professor of English Language and Linguistics at the University of Groningen. Monika received her PhD in English Linguistics from the University of Duesseldorf, Germany, in 2000, for a PhD thesis on first language attrition among German-Jewish refugees in the UK and the US. Her thesis was published with John Benjamins Publishing Co. in 2002 under the title First Language Attrition, Use and Maintenance: The case of German Jews in Anglophone countries. 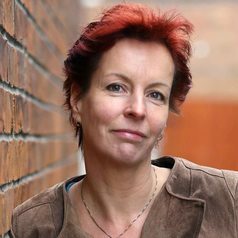 She subsequently held positions as lecturer at the Vrije Universiteit Amsterdam (2000-2007) and as Senior Lecturer (2007-2010) and Professor of English Language (2010-present) at the University of Groningen. Her employment in Groningen will continue on a part-time basis alongside her position in Essex until the end of her research projects in 2015. Her research interests focus on bilingual development and, in particular, on change, deterioration and stability in the native language of migrants who become dominant in the language of the environment (this process is called first language attrition, see also languageattrition.org). Her recent work focusses on the impact of personal factors such as the age at migration and working memory capacities on these processes. Together with Barbara Kopke of the University of Toulouse she has organised a series of conferences and conference panels and edited a number of books and special issues of journals on this topic. Monika has been the PI on a number of projects funded by the German Science Foundation (DFG) and the Dutch Organisation for Research (NWO). At present, she is supervising two NWO projects: one on the age effect in bilingual development, and one on international adoption and language development. Monika's current research projects attempt to provide a perspective on the question of whether there are age-related constraints in the development of first and second languages. She is the PI on a neurolinguistic investigation of the development of grammatical gender in Dutch and German by both second language learners and first language attriters of these languages, with varying ages of onset (the full project description can be found here). A second project investigates the acquisition of English and the attrition of German among German-Jewish refugees who left Germany in 1938/1939, aged between 7 and 17, to live in the UK and the US (the project description is available here). Monika is also interested in the practice of using language analysis to determine the origin of asylum seekers. Together with Prof. Peter L. Patrick of Essex University and Dr. Karin Zwaan of the Radboud University, Nijmegen, The Netherlands, she convenes the Language and Asylum Research Group (www.essex.ac.uk/larg).